This is a continuation of a travel series to Savannah, Georgia. If you'd like to start at the beginning, go HERE. The rest of the posts in consecutive order are HERE, and HERE. River Street is an overwhelming feast for the eyes and other senses because it features so much architectural history and beautiful scenic river views. What surprised me most about River Street was how long it was. My husband and I walked till a construction zone stopped us, and I thought it would never come to an end! It seemed like it was going to go on and on forever! But what also surprised me was all the history and how old all the buildings were. In America, we are so quick to tear things down and rebuild, I'm not use to seeing so much of our history still intact! 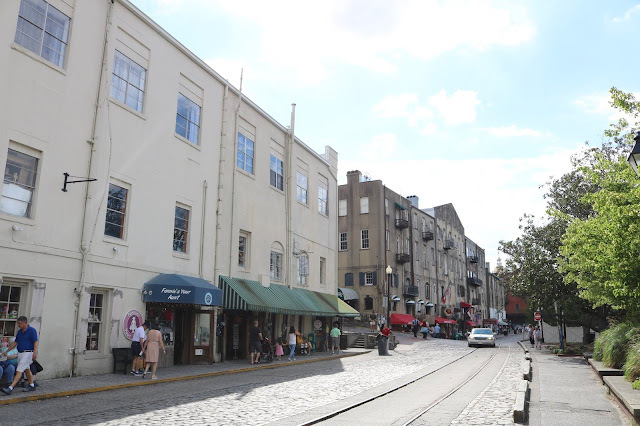 You can drive down to River Street, (I showed the picture of our trolley driving down in my first Savannah travel post), but most people park above and walk down. All the steps are quite treacherous and have "use at your own risk) signs. The River Street road still has trolley tracks and brick pavers! 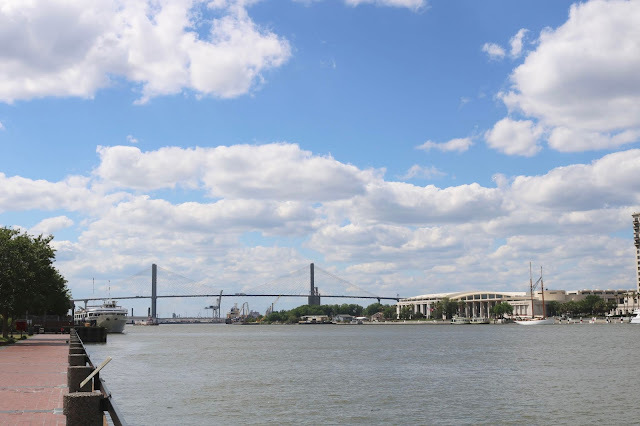 Savannah's riverfront has been at the center of it's history since 1733 where it was the shipping and export of rice and cotton. All the buildings were cotton factories or warehouses now turned into shops, restaurants, and hotels. I spotted this tee shirt and had a good laugh with my husband! Yup! That would definitely describe me! Savannah is known as a "Party City", but I wouldn't know from experience as we were back in our rental house at 7:00 pm every night because we were exhausted. I had hoped to see River Street lit up at night as I saw photographs of it on Pinterest and it looked beautiful. However, it was such a long walk back to our house and the free bus service stopped at 7:00 p.m. so we never got to see it lit up. In all my travels, I have never seen such interesting architecture other than in Florence, Italy. It was truly remarkable! The Factor's Walk especially awed me because of the huge discrepancy between the river level and city level. (as shown in the first two pictures of me walking down the steps). There are also many footbridges connecting the city-height (Bay Street, where the brick wall is) to the upper levels of the warehouses on River Street. River Street is the place to go to eat! We popped our heads into most of the restaurants to check them out. We couldn't believe the thickness of the brick walls! There is so much Pirate history in Savannah! I will cover more of that next week when I review our trip to the Pirate House! Savannah is also rich in nautical history, they even have a special museum dedicated just to ships! Here you can see another set of steep steps along with warning signs. It really is quite the challenge getting up and down these steps. They are very, very steep and not evenly spaced apart. I have no idea how the elderly or handicapped get down to River Street. Either they just view it from the trolley, or someone drives them down. 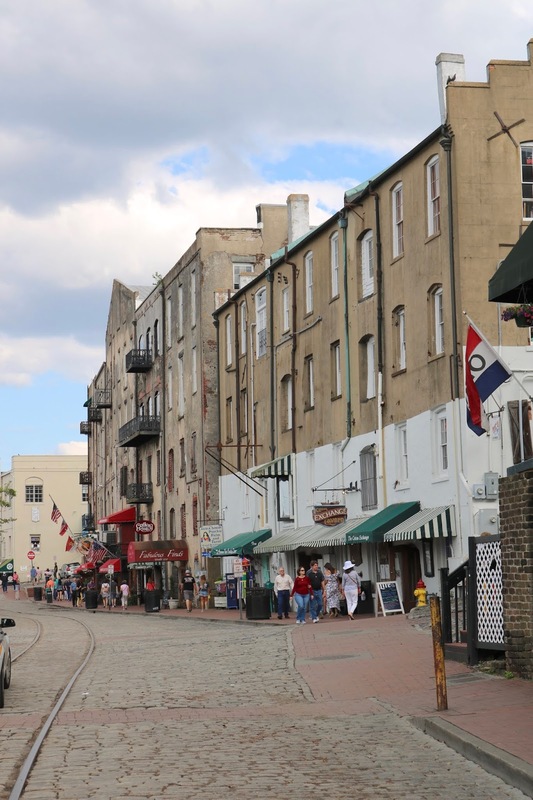 But there's so much more to River Street other than bars, restaurants, and hotels, because right on the other side is the Savannah River! And it is absolutely gorgeous. One of our most enjoyable days spent in Savannah was watching all the boats on the river. Be sure to check out the video at the end of the post where we see a container ship, river boat, and a vintage tug boat! 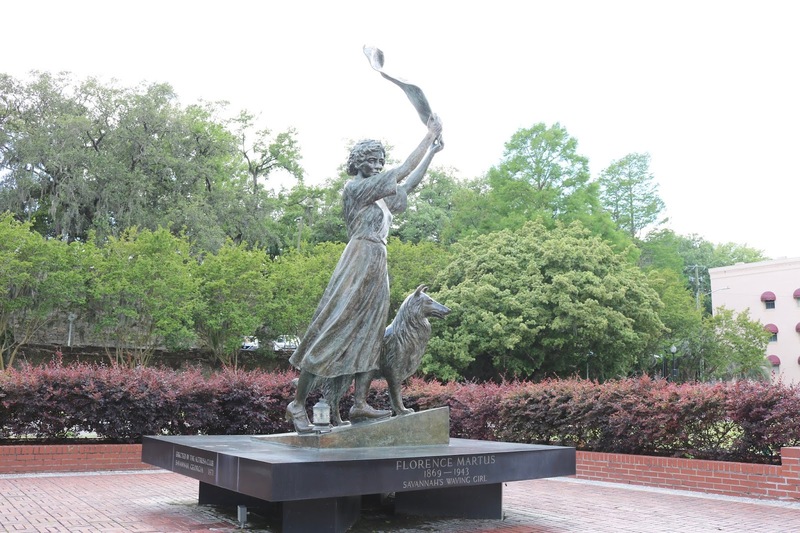 This is the "Waving Girl Statue" that commemorates Florence Martus. Legend has it that for more than 40 years she met and waved to every ship that sailed up the Savannah River! The Savannah River Walk is so gorgeous. The views of the Talmadge Memorial Bridge is spectacular! 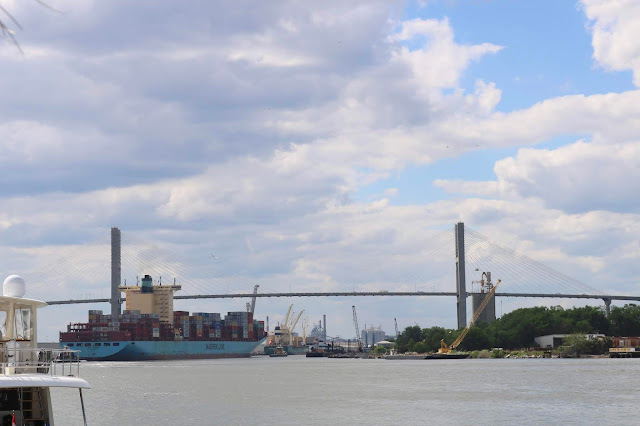 We were so lucky to see this container ship come in and go under the bridge. From our viewpoint, the boat looked so much taller than the bridge that I didn't think it would make it! But it did! To give you an idea of the size of this ship, each rectangle you see on the ship is what fits on the back of a semi-truck and there are 1000 of them! Here is the River Boat! They offer river boat cruises on the Savannah River. We did not take one, so I can't review it for you. I just loved this vintage tug boat! There is also an entertainment area for live music set up on the River Walk. And finally, here is my video. It's a little long, 10 minutes, but it's fun to walk and hear the excitement in my voice. Next week I'll continue with Day 2 and review where we had lunch...The Pirate House! Ahhhh...we absolutely loved Savannah when we were there (and we don't stay up late either..ha ha) One of our jokes is I had to buy new shoes because I didn't realize there would be so much walking---but the city is so picturesque!! haha! Good to know we were not alone! Yes, everyone warned me I'd be walking a lot, but I didn't believe them. We were so exhausted from walking all day we were usually in bed by 9:00 p.m. BUT we also got up super early. We loved Savannah in the wee hours of the morning. The light was so beautiful and it was so peaceful. Looks like you had a fabulous day exploring River Street! Great pictures! I would LOVE to visit Savannah one day! River Street looks like such a fun, quaint area! It was fun seeing your photos! I hope you get the chance to go there someday Laura! It is so beautiful! Yes, it was! Thanks for stopping by! Always a pleasure to read your blog and admire your fine photos, Amy!